Given our world today and the anti-Semitic acts and threats we read about daily, the timeliness of our observance of Purim could not be better. We, of course, are not strangers to hatred of anything “Jewish” sometimes leading to actual violence perpetrated by those with any number of despicable motives. 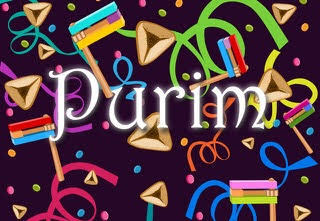 Purim is a time when we take a “time-out” from our daily activities and defy the craziness of the world by celebrating our “last minute” salvation with raucous celebration and festivities. We dress up in costume and swirl our groggers to drown out the name of Hamen who sought the destruction of the Jewish people and very nearly came close to doing so. We recall and understand that but for the intervention of Esther with the insistence of her cousin, Mordechai, our fate was sealed. They acted, true to their identities and at the grave risk of losing their lives by doing so. In the face of persecution, they never lost their identity as Jews. Purim reminds us of how capricious life may be, of how vulnerable we are, and how so very much seems to be beyond our control. We were destined for destruction, but as we read in Megillat Esther, “grief turned into joy, a day of mourning into celebration” (Megillat Esther 9:22). Everything that was supposed to happen did not, reinforcing that life can change in an instant. We take the time of Purim to celebrate life in the face of unpredictability, but also understanding that we never lose ourselves completely, we never give in to those who seek our destruction, no matter how many Hamens there have been, by allowing ourselves to be defined by them. We define ourselves by fully embracing who we are by engaging in acts of kindness, love, justice and compassion. We know we are responsible for one another within our own community, but we also go beyond by assisting others, sending sweets to each other and gifts to the poor. We understand that societies filled with compassion would make our world kinder and gentler and so we reach out with kindness and empathy to the stranger because we were once strangers in the strange land of Egypt. God requires this of us in the Torah no less than 36 times. Rather than oppressing because we once were oppressed, we act righteously by breaking prevailing patterns of behavior. We speak out and work against injustice wherever we see it. In short, we strive to treat others as we would want to be treated (Leviticus 19:18). This is the Jewish way. Time and again we have learned might does not make right. Life doesn’t always make sense. It is unpredictable, fragile, often chaotic and sometimes even terrifying. The longer we live the more we understand how little we can control. And, along comes Purim, thank goodness, beckoning us to celebrate life by trying not to make so much sense of everything because not everything makes sense. We dance, we dress in costume, we drink, we party to defy for a few short hours the capriciousness of our lives. And, perhaps this is a very sane way to respond to the craziness of our world.